This report focuses on Tamil Nadu’s key growth sectors such as Automotive & Auto Component, Aerospace & Defence, Agriculture and Food Processing, Engineering, Energy, Healthcare, IT & ITES, Poultry, Textiles and Electronics Manufacturing. It highlights the significant contribution of Tamil Nadu to the growth of the Indian economy and also key focus areas and initiatives of Vision 2023. 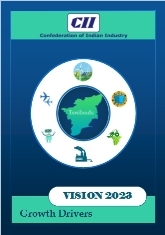 The report specifies sector wise targets as per Vision 2023, progress made by the State so far, key considerations and growth drivers for the State to focus on to realise the Vision 2023.